Where is the Todos Santos Real Estate Market Heading? Todos Santos was recently designated a “Pueblo Magico” in 2006 by Mexico’s Secretariat of Tourism, based on its cultural beauty and historical relevance, which keep tourists coming back year after year. This designation has increased Federal funding for city improvements, roads, and the municipal infrastructure. The windy little 2-lane highway 19, connecting Todos Santos to La Paz and Cabo San Lucas, is now a 4-lane super highway. Connecting to La Paz, which is the states capitol and major supply port, is crucial to a healthy economy. The connection to Los Cabos is now only a 45-minute drive. Cabo, overcrowded with tourists, timeshare salesmen, and street peddlers, has left many disenchanted tourists and investors fleeing North to Todos Santos for a little piece of tranquil paradise, that can be found in Todos Santos real estate. 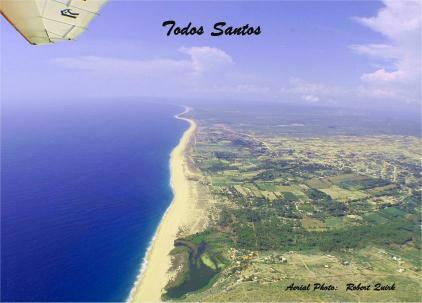 Todos Santos is located in Baja California Sur (B.C.S), one of 32 Mexican States. It has a very low crime rate, and the lowest homicide rate in the country, with only 42 reported homicides in 2011. Worried about driving South to Todos Santos? The most dangerous part of your trip could be driving through San Diego. Although most of Baja is a desert, Todos Santos sets on a natural water table, making it an oasis with green, lush vegetation. Where fresh water is an important issue in most Baja cities, the abundance in this little village has opened up farm land agriculture, growing green chile poblano peppers, spices, tomatoes, strawberries, and much more! To fully understand owning real estate in Mexico, one must know the laws of the land. The Mexican Constitution of 1917 imposed laws restricting land ownership of foreigners in the “restricted zone”, which is any land within 30 miles of the Mexican coastline, or 60 miles from any of its borders. The Constitution was amended in 1994 to allow foreigners to own land in the restricted zone through a land trust, or “Fideicomiso”. The Mexican government allows a Mexican Bank of your choice to purchase the property and act as the “trustee” in a Trust, very similar to Estate Trusts or Living Wills in the United States of America. The buyer is the “Beneficiary” of the Trust, and you are free to rent, sell, occupy, and build on your property, with all the same rights as full ownership. Many refer to the Fideicomiso as a lease, which is incorrect. The initial term of the trust is 50 years, which can be renewed during the last year of the trust for another 50 years, and so on, indefinitely, allowing for long term control of the investment. PLEASE CONSULT A LEGAL MEXICAN REAL ESTATE ATTORNEY FOR CURRENT LAWS AND REGULATIONS. Is Todos Santos Real Estate Poised to Boom? Why investors are so attracted, and skeptics should be!